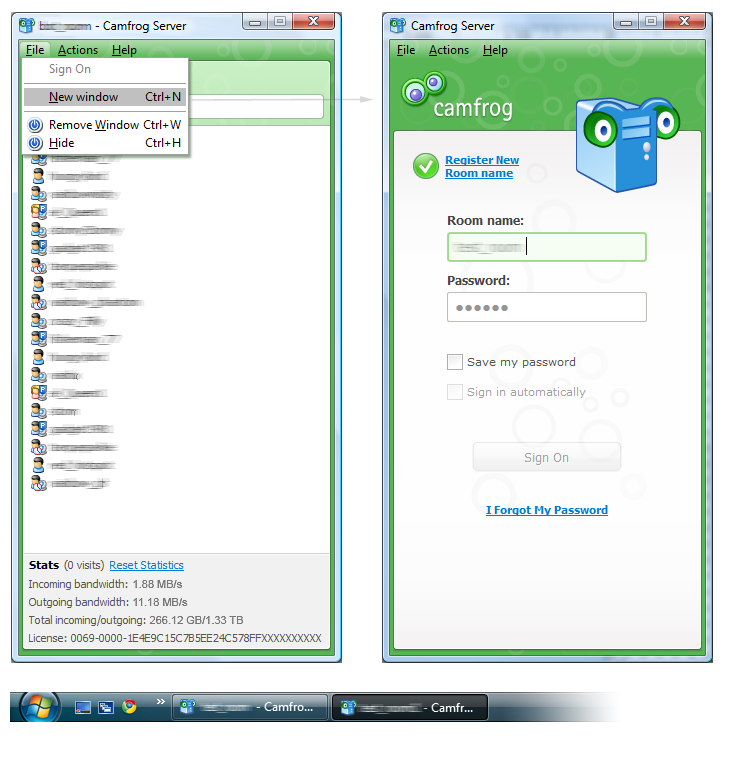 Camfrog Video Chat Room Server 6.0 for Windows and Linux are now available for download. Our new Camfrog Server software has a new modern interface, new audio modes, an improved web interface, and simplifies the ability to open multiple video chat rooms. Camfrog Server now has three audio modes. Go to the “actions” menu in the main window and choose “settings” then under the “general” tab choose your preferred audio mode at the bottom left. “Push to talk” mode is our classic Camfrog audio mode. You can also choose “Push to talk for multiple users” and then on the right side you can choose the number of users you’d like to allow to talk simultaneously. If you choose “hear all visible users” audio mode, then you can hear the audio of any user you view in the video chat room. If a user’s audio is too loud you can always mouse over their remote video window and mute it or close their window. We look forward to seeing what new fun and interesting things Camfroggers do with these new audio modes. Please note the new 6.0 client is required to use these new audio modes. With the new Camfrog Server software it’s much easier to create multiple rooms on one server. Go to the “File” menu and choose “New window” and suddenly you have two Camfrog Servers available. To close one of the rooms click the X in the top right of the window. To exit the application completely go to the bottom right notification area and right click the Camfrog Server icon and choose “exit”. Download Camfrog Server Now and give us your feedback. Thanks for hosting Camfrog Video Chat Rooms! whenever i try to join this one room i know is up t says canot connect behind firewall or something. Anyone know how to fix this? Blueball, i dont think camfrog is removing peoples rooms. I personally think you have paid somebody to host a room for you and are getting screwed. This is really a problem that people have been doing latly. I could be wrong, but all i have to say is, if yoiu dont see a windows desktop or linux desktop and the camfrog server icon, than you may of just got beat out of your money. I have seen people sit there and think there owning a room for a good price, but in reality thier room is on another persons computer or server thats also sharing other rooms. Getting room hosting on somebody else computer or server has caused alot of problems. 1, stolen room or bot codes, 2. promising your room will be up and taking it down before the next month and so forth. Shared room hosting has always been a problem. Thats why its best to host your room on a dedicated server or your home computer. @tirevs.. do you understand what you’re saying.. what this is all about? lol… im going to believe you if you actually own a room or at least paying one of any camfrog products. and what about camfrog iphone they can’t hear and talk on room if room mic set to new settings like 2 user same time or mic for visible user need update Client befor updating server right? kirstenjav i got 6 camfrog pro codes and tons of server pro codes. I do own my own rooms, i got 4 rooms currently up and i have 4 bots. Also i been on camfrog sence camfrog released version 1.2.1 and i have been a co owner and op+ in the official rooms for a couple years and i know most of the orignal users that was on sence 2003 and i have hosted rooms for people. So yes, i do think i know what im talking about. If a person pays 30 dollars or more for somebody to host their room, yes, it is more of a risk of losing the room and code and money. Having a dedicated server or running the room on home pc is alot safer and nobody can ripp the person off. my statement to the hear what you see audio settings. Great work with a lot of possibilities. Multible dj´s at the same time on air in the room, and talkrounds, between users, listening favorite dj in the room and talking same time with other users, all is possible, if you own a headset and have a pro serial. Seems to be full dublex, the best is, listening the dj and talk, with others at the same time, is really nice. But you have to try it to believe what are multible meta rooms in one room. The best think is the , the user can make the choice. Really great work thx. Camfrog Server 6.0 from the web panels When we get an SSL certificate error. What should we do to avoid this error. Error image link below. OK Admin can get simple explanation for how install camfrogserver 6 on Lunix can please ?? 6.0 features are looking very nice and cool, I like it. However, very disappointed.. it CAN NOT LAUNCH separately in second, third, Remote Desktop, etc, it is not like old version 4.3.3. with each .exe to launch separately. I tested 6.0 in Administrator mode on Windows 2008 working fine. I think it’s only for Admin only. Camfrog is unable to connect to the video streams in this room. Please check your firewall / antivirus software settings or visit the Camfrog FAQ page. ONE QUESTION: After days of testing the “you hear what you see” option, we found out, that it is only working if you open only 2 cams at the same time, or the other possiblility, open 4 cams and you hear 3 audio streams from the cams. If you open more than 4 cams at the same time, the audio isn´t working correctly anymore. Was this planed, because, If you are writing, it is possible to listening any cam you open, a pro user is interpreting it as opening all users in the room. Isn´t it? What information is needed to access the new 6.0 CF Server Web Control? i dont find log and web panel certificate ????? When you try to change your server ( Room ) password on the website ..the page http://profiles.camfrog.com/settings.php does not load. I don’t know about anyone else but /setopt commands don’t work. The new audio mode doesn’t work right. They still have no timestamps on the Camfrog 6.0 client in the chatrooms. There is no HOWTOs on the camfrogserver for linux so users have to fend for them selves. I will be updating my howtoforge tutorial on how to run Camfrogserver under Ubuntu (debian) for those users who don’t run RedHat AS/ES 4.x 5.x, CentOS 4.x 5.x, Fedora 6.x 7.x 8.x. operating systems here in the next few days. Hello admin, I ask you: I is server Linux, deja, I make install(settle) camfrog server 6.0, but, how make opened room also command(order) for Linux? Thank you! IPHONE APP + NEW SERVER AUDIO SETTINGS = NO WORK!